Debra Danese: Your alter ego, Jomama Jones, will be making her Kimmel Center debut in BLACK LIGHT. What can you tell us about the show? Daniel Alexander Jones: Black Light is a musical revival for our troubled times. Jomama and her band invite you on a journey that reminds you of some signal lessons from the past, that invites you to look at both the intense uncertainty and possibility of our current moment, and that turns our eyes toward the future, together. All of this happens within the dynamic context of Jomama’s original songs, humor, stories and signature spontaneous conversation with the audience. In Jomama’s eyes, your beauty and your bravery walk hand in hand. DD:You are known for your storytelling. What message, or story, do you convey in BLACK LIGHT? DAJ: I love people’s stories. Stories give us the contours and the context of someone’s experience. We can listen to a story with the whole of us. We can feel it. There are several stories in Black Light that are woven together across the evening. But one common thread is that Jomama wants you to feel; and to feel all your feelings fully. So many of the stories that define us have both light and shadow; what if we give ourselves and one another permission to hold all of our contrasts and contradictions? What might be possible? That is a core part of the message of Black Light. DD:How did you create your alter ego, Jomama Jones? DAJ: Honestly, Jomama chose me. I have created many characters across my career. But Jomama arrived 100% whole, in 1995. She is genuinely an alter-ego; I channel her and am not in charge of her or what she does. That is a humbling thing for a Type-A, control freak artist to admit! She arrived with a full personal history and her own philosophy; over many years she has grown and expanded and inspired me to take many risks that I might not otherwise have taken. She has links, for sure, to a lineage of Black performer/creators who harnessed the power of their persona to activate something larger through their performance work and their relationships with a wide range of audiences. Jomama has paid homage over the years to many of them, including Josephine Baker, Lena Horne, and Diana Ross. DD:What do you and Jomama Jones have in common? DAJ: We are both tall. (Haha) I think an abiding love for Black American culture, a deep desire to make space for people to listen and be heard in a liberating way, a deep desire to foster bravery in self and other, and a love for the natural world. Those are common things. Where we differ? I think I carry more distrust or disappointment than she; she, like a wiser older sister/cousin, seems to have transmuted much of the kind of fear I have walked with in life. She has, I believe, seen the future. DD:You often work with other artists on your original songs. Can you tell us about some of these collaborations? DAJ: Jomama Jones made her “comeback” in 2010. I began working just before that with a true musical genius, Dr. Bobby Halvorson. It is with Bobby that we found Jomama’s contemporary expression. The fact that Bobby and I had such different musical backgrounds and approaches has made for a powerful alchemy; we inform and push one another, yet, there is a deep love and respect for music and for one another’s creativity that has guided us. Together we have written and recorded over 45 original songs. I recently wrote a song with a musical wunderkind, Dylan Meek, that is featured in Black Light. It’s called Crossroads. It has become many folks’ favorite Jomama song. In many ways, I’m coming to understand Jomama as a High Priestess of the Crossroads. She is here to illuminate our choices, to celebrate our capacity, and embolden us to make them, but not to make them for us. Finally, I’ll mention the work I have been able to do recently with the astonishing Samora Pinderhughes, who will be musical directing Black Light. Samora composed songs with me for the recent Soho Rep show, Duat. He is an endlessly gifted artist whose soul is old and deep, even as he is representative of the most powerful and generative aspects of his young and vital generation. The choices he makes, the phrasing he commands, are nothing short of sublime. DD:Who are your musical influences? 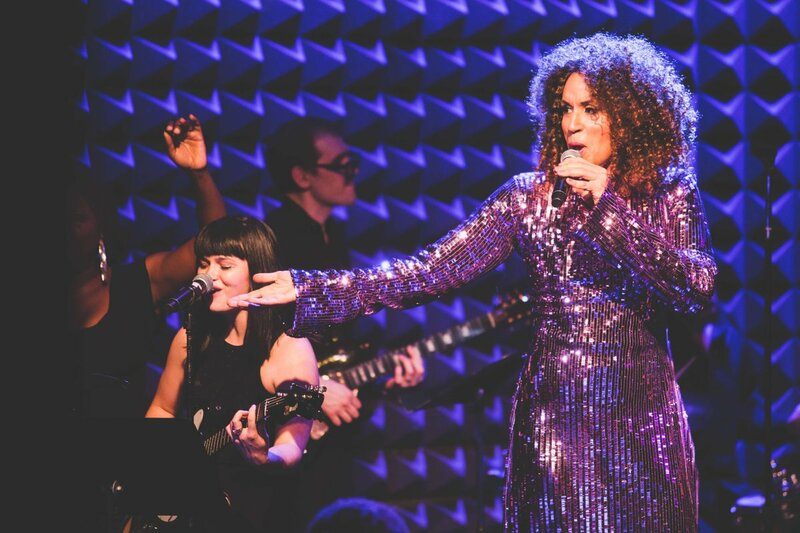 DAJ: In addition to Baker, Horne and Ross (and all of Motown), I would say that I have been most strongly influenced by the singers and singer/songwriters of the 1970s and 1980s (from Teena Marie and Patrice Rushen, to Minnie Riperton and Sade) and also by soul music and electronic pop musicians from the UK (from Jaki Graham to a-ha, to Mica Paris and Loose Ends). I have an unabashed love of the pop/soul song. I am a jazz lover as well, but while jazz shows itself in the structure of my performance pieces and plays, it is not so much a direct sonic influence on Jomama’s sound, at least, to this point. DD:Jomama took a 12 year hiatus before returning to the stage in 2010. What was she doing during that time? DAJ: She was raising goats in the Swiss countryside. She still has four: Hans, Ingebor, Myeisha, and LaQuonna. Jomama is back. And I’m glad she’s back. While I’ve continued to create other projects, Jomama has a parallel path, and right now, she has a lot to sing about, and a lot to say, and hopefully a lot to do in service of what is next for us all. [SEI Innovation Studio, Kimmel Center, 300 S. Broad Street] May 4-6, 2017; kimmelcenter.org.